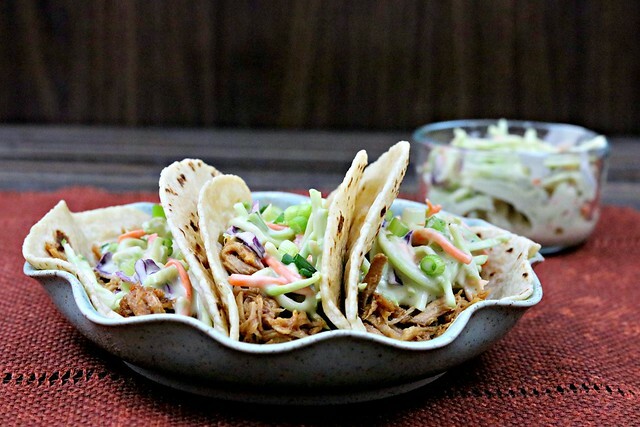 Slow cooked bbq pulled pork topped with creamy and tangy honey mustard slaw makes a perfect warm weather taco! No oven and very little hands-on time! So, I’m a day late for Taco Tuesday, but let’s be honest…tacos are good any day of the week. All day, erry day. amiright?? Yesterday J and I celebrated our second wedding anniversary. TWO years!! It’s so weird but it feels like we’ve just been together forever. It seems like it was ages ago that I was planning our wedding. But it’s only been 2 years. I guess a lot has happened since then, what with having a baby and all, but it’s been a fabulous whirlwind of joy and excitement. And exhaustion. Parenting is hard, y’all. It’s joyous and a blessing, and we love her more than we ever knew we could love another human, but sweet baby Jesus, it’s exhausting!! Mama is on 24/7 (well, other than when she’s at daycare, but you know what I mean.) I believe we have entered the beginning phases of separation anxiety and if I move 2 feet away from her, it’s like her world is ending. It’s sweet in a way, that she wants to be that close to me at all times, but it’s exhausting. And J does an amazing job at keeping her occupied while I cook dinner, but if I happen to cough or make any sort of noise that draws her attention to where I am in the kitchen (and not right there with her), 9 times out of 10, she’ll start fussing and whining because she wants to get to me. And, since she has started to crawl a bit, it won’t be long until she books it into the kitchen to do just that. I talk about her new mobility in the latest Baby Bites post. And since it was our anniversary yesterday, I decided to make a little fancier dinner than normal (sorry, Taco Tuesday – I love you with all the fluffy hearts in the world but anniversaries call for a little more.) J really loves tuna steak, so that’s what we had. Pistachio-crusted tuna with mustard-dill cream sauce, couscous, and asparagus. It was divine. And definitely worth postponing Taco Tuesday. But nevertheless, I have a taco recipe to share with you today, even if it is a day late. I’ve mentioned before how I really love my crock-pot. You know, the programmable one we got as a wedding gift? It comes in so very handy, especially now with the baby. 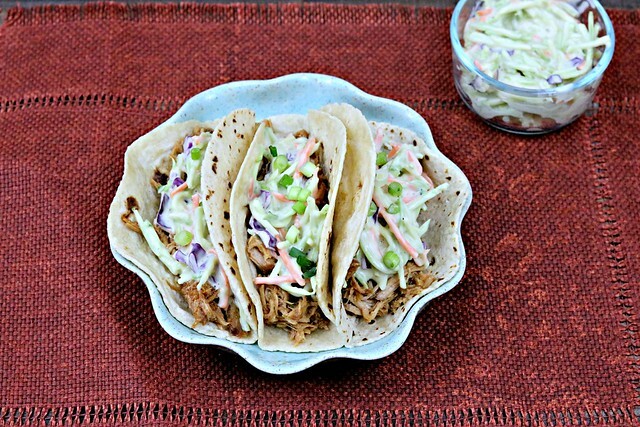 When I made these tacos, all I had to do in the evening was throw the slaw together. The honey mustard slaw. Ermahgerd, y’all. This honey mustard slaw is life. Like, slap you in the mouth with flavor, life. I’m not sure I can ever make it another way again. Ok, that may be a little dramatic, but I’m only half-joking. It’s that good. And of course the BBQ pulled pork is amazing. Pulled pork pretty much always is. I’ve never met a batch I didn’t like! And the leftovers are great for so many things! Pulled pork sandwiches, nachos, mixed with eggs for breakfast, more tacos, stuffed in a potato…the list goes on! J really liked the slaw. Like, really, really liked it. I bet I could make the slaw on it’s own as a side dish and he’d eat the whole bowl! 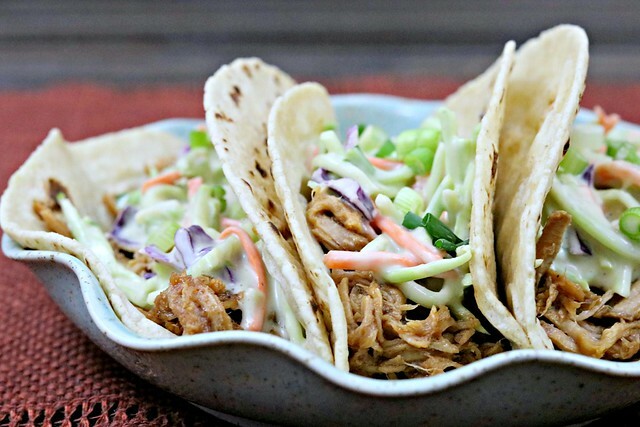 Slow cooker meals are so great for summer, and it is definitely summer in Texas. Of course, it has been since April – so there’s that. Ha. But I know so many people who try to grill out or use their crock-pots as much as they can in summer to avoid turning on the oven, and this is a great recipe for just that scenario. As I’m writing this, I’m wishing I had some right now, in fact. But we will again, very soon. I stashed some of the leftovers in the freezer, so that will make a great weekend meal for us soon! Slow cooked bbq pulled pork and tangy honey mustard slaw are the perfect combo for a game day slider – or any day! Liberally season the pork with salt, pepper and garlic powder, then brush the top with your favorite barbecue sauce. Place in a slow cooker on low for 8 hours (or on high for 4 hours). Shred pork with two forks, and mix with extra barbecue sauce (amount will vary depending on size of your pork and your desired coverage - we like it saucy, so we added about a cup to our 3 lb pork roast). Combine all of the slaw ingredients, besides the slaw itself, in a bowl and mix well. Stir the slaw in until thoroughly coated. If you use a traditional coleslaw type of mix, I would wait until you are closer to ready to serve to mix so it doesn't get soggy. The broccoli slaw holds up better, which is one reason I like it better. To assemble sliders, toast the buns or rolls, spread some mayo on the bottom bun if you like a little something extra, then top with a generous heap of the pulled pork, a few tablespoons of slaw, and then the top bun or roll. These look so fresh and tasty – perfect for this hot weather! yum!